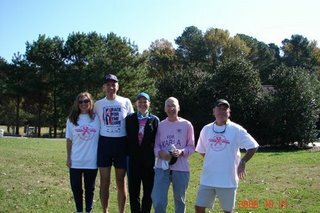 On Saturday Oct 21st, I met Karla and Frank over at Lake Benson Park in Garner for the Mayor's Walk for Cancer. 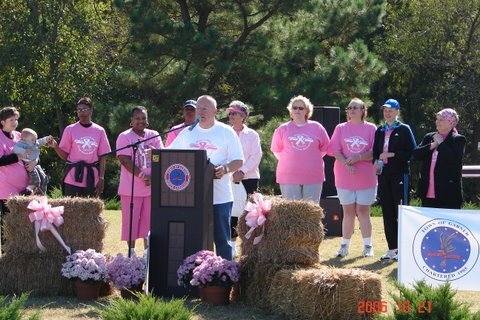 It was a first year event with the proceeds going to the Susan G Komen Foundation for Cancer Research. You can see Karla in the blue hat being recognized with the other survivors in attendance. It was a beautiful morning and there were approximately 100 participants in the walk. We were happy that our friends Laura MacLean and Alan Hughes came out to show their support for Karla and enjoy a nice walk around the park. 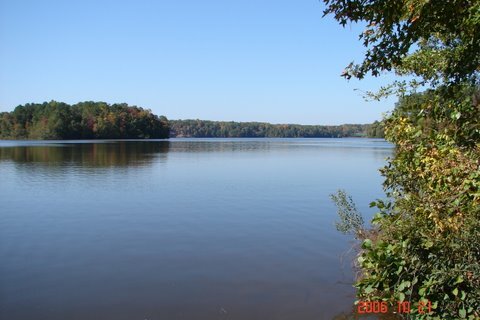 I grew up about a mile from Lake Benson and spent a lot of time exploring in the woods and fields surrounding it. At that time in the 60' the area was very rural with only about a dozen houses within 2 miles of my home. Mostly farmland and forest. There used to be an old boathouse and bait shop at the lake and I spent many an hour hanging out there during summer vacation. My parents still live in the house I grew up in.